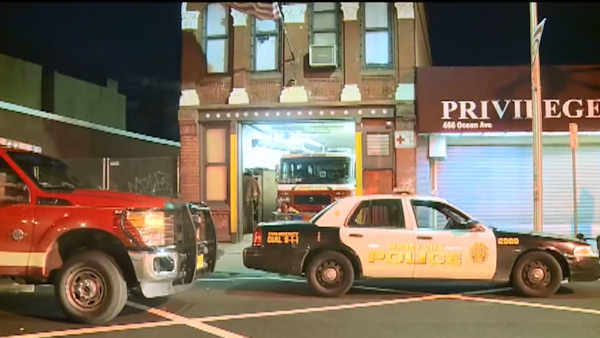 JERSEY CITY, New Jersey -- Firefighters made a heroic rescue in Jersey City, but at the same time someone was breaking into their firehouse. The firefighters found a broken window and their valuables missing, after they returned from the scene of a house fire late Thursday night. The men were battling a blaze in a 6-apartment building. "We had a 16-year-old trapped on the third floor," said Jersey City Fire Chief Darren Rivers. "Members of Tower Ladder 4 put up their aerial to the window where the victim was located. They entered the building and assisted them into the bucket. He did sustain some injuries to his hand." But back at the firehouse, the criminals were breaking through a window. "Unfortunately we had some perpetrators break into the firehouse and steal items from the firefighters who responded to the fire," said Rivers. "This is very disheartening for this unit as it serves this community with such diligence and professionalism," said Deputy Fire Chief Wayne McCarthy. "And to have this happen after they just made such a heroic rescue is very shameful." Eight firefighters are stationed at the firehouse, in a neighborhood that they belong to. Chief Rivers acknowledged crime can happen to anyone. "Regular citizens deal with this all the time," he said. "These guys are professionals, they love the job they do, they love the people they serve. And if they had to do it again, they would choose to save that life. That's what most important." And that's what made it so maddening. The heartless thieves stole wallets, cash, credit cards, laptops and tablets, taking advantage of the brave firefighters who saved a child's life. As Chief Rivers said, it's demoralizing, but: "The loss of money, credit cards, tablets, it means nothing. Those items can be replaced. But what's most important, we were able to pull that young man to safety and the family members don't have to worry about preparing for a funeral," he said.